I decided I needed to write down some healthy eating guidelines for myself. That led me to thinking about how big a role stress and lack of sleep play in my eating habits and I decided what I really wanted was a healthy life. So I expanded my manifesto just a bit. The last few months I have been reading a lot of books about diet, nutrition and eating habits. Many of them left me feeling like I needed to have an MD (or play a doctor on tv or sleep in a Holiday Inn Express at least) to know how valid the logic/research/argument was. I was left to rely on my own common sense. And Michael Pollan’s “Food Rules”. I love this beautifully illustrated little book of 82 rules. I understand them, they make sense to me and they are easily followed. By that I mean anyone can do them with a little time and effort. No special pills or equipment needed. 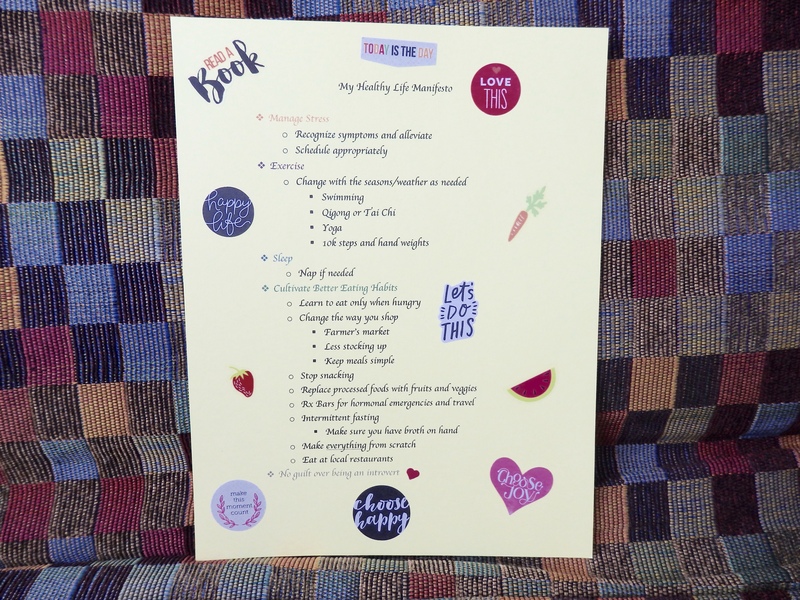 I plan on glancing through this book daily to give myself reminders of how I want to eat. What I like about this manifesto is that it is set up for me. Yes, you can borrow it as a starting point for your own but you really need to devise a manifesto that will fit your own life. Every person is unique with an individual set of circumstances that make up your own needs. 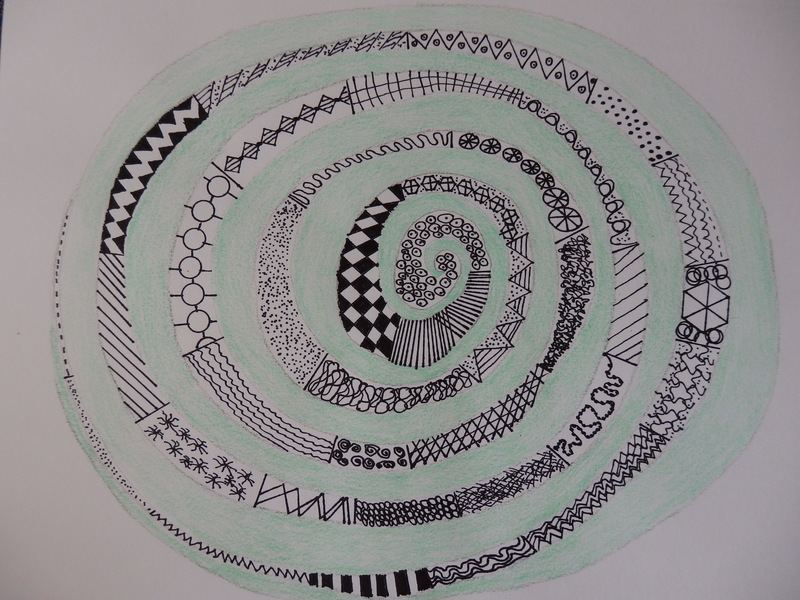 An example of managing stress, I felt very peaceful when I worked on it. And I finished it! So there it is, my Healthy Life Manifesto. I am not sure about the fasting. It seems better suited to people who are obese and trying to lose weight but I have decided to keep it in my hip pocket as a back up plan if I am not doing well with controlling my snacking or the middle age weight gain continues. I printed out two copies, made them all pretty and put one in the kitchen and one in my office. I’ll be reading them everyday for now. I am ready to feel not just better but good, really good! I have been feeling anti-computer these days. Not sure why but in reflection I don’t think that is a bad thing. My dream life right now? Solitude in a mountain cabin. I would take long walks along a stream or around a lake. I would sit on the porch with a mug of tea and listen to the rain. I would end the day in front of the fireplace with a warm bowl of soup and some homemade bread with butter. For a project I would take a picture of the same thing once a day, at different times and in all sorts of weather. Maybe a tree or a spot on the lake or a flowering shrub. Whatever took my fancy. The last six weeks have been tough physically and mentally. I have had no energy and no focus. Allergy season is at it’s peak. I have been sleeping poorly. I had a twenty-one day period. I appear to be on the same rollercoaster as the weather! Last week we had our first 100° day, actually two of them and I took my first swim of the season. 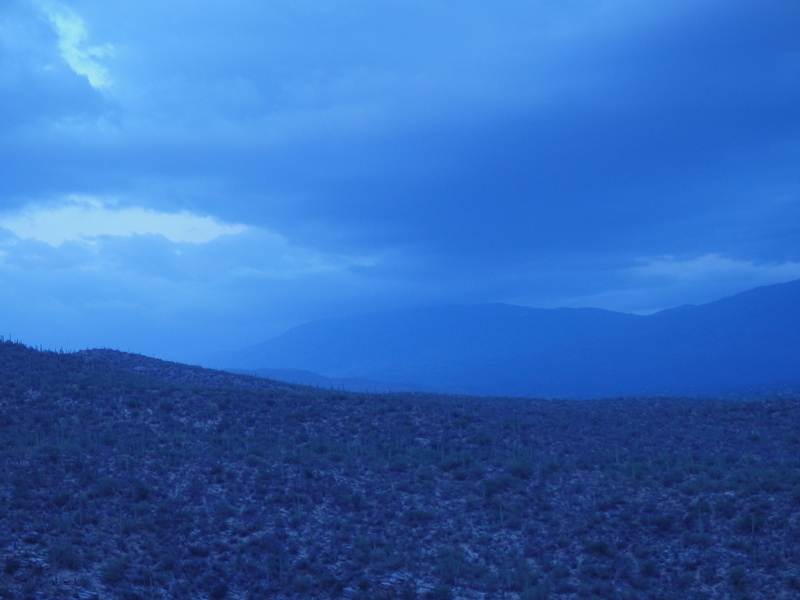 It was quite lovely until a gusty wind began and a few drops of rain fell. Then the pool was a mess of pollen and debris. The beginning of this week we were in the 70’s with some rain so I am back on the treadmill. Hopefully the solar cover will keep enough heat in the pool so when the temperature boomerangs back to the upper 90’s at the end of the week we’ll be able to start swimming in earnest. 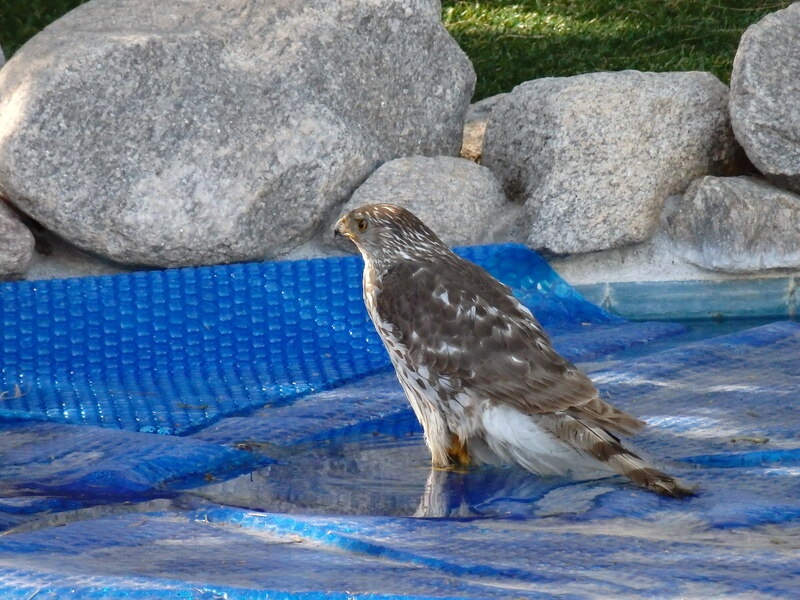 I took this picture this morning, how cool is it to have a bird of prey on your pool cover? I am thinking maybe a Hawk? I have retreated into what I think of as survival mode. I have ditched the habit tracker and the routine. I am taking each day as it comes. You would think I would be a big slug right now but a surprising thing happened. I started doing random tasks. I have cleaned out one whole drawer of the file cabinet. I tackled the memory box project that was one of my cleaning goals for the year. (One and two are done with a good start on six.) My son and I spent 10 minutes each night after dinner picking up his room. I am so happy to be able to walk in there again without twisting an ankle! 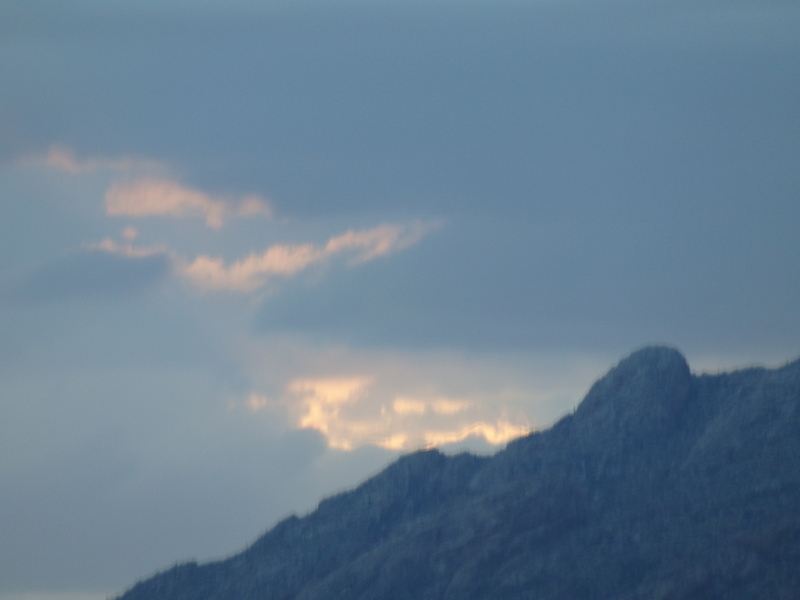 Sunday night we took a family walk over to Sabino Canyon hoping to get up high enough to see the sunset. Turned out it was too cloudy and we left a few minutes too late to get a really good view but it was a very pleasant walk anyway and nice to do something out of our ordinary routine. Ditching my habit tracker and to do list has been good. Rain to the East during our walk. Yesterday I took a four mile hike, something I promised myself I would do at least once when the school year started. The hike merits it’s own post so stay tuned. Today I am feeling better. I have slept well the last two nights. The hot flashes and night sweats are on vacation. I don’t know if it is hormones or the cooler weather but I will take it. My allergies are not as bad. I like to think the wind blew the pollen to New Mexico and the rain washed what was left out of the air. I find I am actually looking forward to today. I will wash my car and paint my toenails lilac while watching one of the many movies I have on my DVR. And popcorn, I deserve popcorn!